One Great Tip, One Great Recipe...Just in Time! When it comes to Thanksgiving, I love things that I can do a day or two ahead of time. Recently, my gang and I had meatloaf night at my house. Oddly enough, all I had to make was a side dish and mashed potatoes. My friend Karen makes the best meat loaf and it was her job to provide the entree. She brought three heavenly loaves. And it was the two side items that I had to make that taught me two valuable tips. Well, one tip, and one great recipe. Both of which I will be using on Thanksgiving. First the tip! If you have seen the Facebook video that shows how to peel a potato with your bare hands,..I'm here to tell you it works. I washed, scored a circle around the skin, then cooked seven pounds of russet potatoes and easily pulled off the skins. No more peeling in this house for me, or my daughter in-law Kathleen who inherited this chore when she joined the family. Go to YouTube and type "How to peel potatoes with your bare hands" into the search box. It only takes 30 seconds to watch but will change the way to do things for a life time. You'll never use a knife to peel potatoes again! Now, for the recipe. 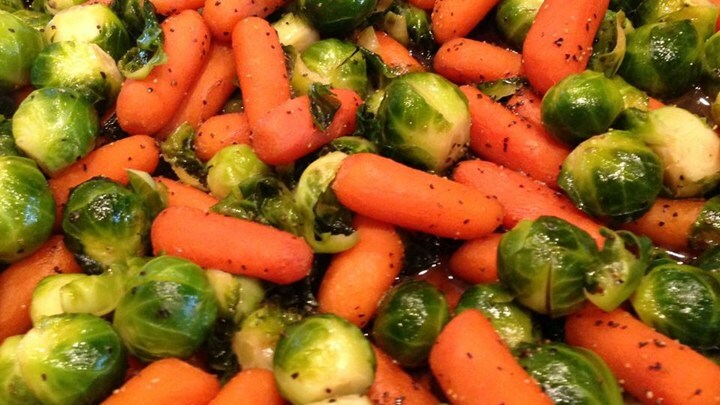 I admit that brussel sprouts and carrots can be made a thousand ways. I can further add that I'm really not of fan of the sometimes bitter, round, green balls. But since my friends insisted we have a vegetable with our meat loaf, I did a little research, and then a little altering, and a new gem was born! Then, bring stock, butter, and brown sugar to a boil in a heavy large skillet. Stir until sugar dissolves. Boil until reduced by half, about 7 minutes. Can be prepared 6 hours ahead;(like early Thanksgiving morning). When your ready, return to boil status before continuing. Add carrots. Cook until almost tender and sauce begins to coat, shaking pan occasionally, about 6 minutes. Add brussel sprouts and salt and pepper to taste. Cook until heated through, stirring occasionally, about 4 minutes. Just before serving, toss in the crumbled bacon bits. Thanksgiving has become, for me anyway, a time to cook a great meal for my family while also wanting to spend less time in the kitchen and more time with them. Anything I can make ahead is on my list this year...and every year! Enjoy! To Brine or not to Brine...Questions? According to Iron Chef Geoffrey Zakarian, "Brining the turkey is an unnecessary step that just adds more stress to an already stressful day," That being said, more and more people are taking that step. 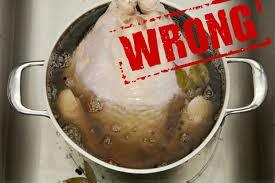 I started brining a turkey over 10 years ago when we added a deep fried version to our Thanksgiving table. My thought process was that you obviously can't baste a deep frying bird, and it only takes 3 minutes a pound to cook, so the flavor needed to be added BEFORE the cooking process. Ignore that we also inject a creole butter mixture into the breast before submerging into the oil. Here is a brief explanation to science of brining. Moisture loss is inevitable when you cook any type of muscle fiber. Heat causes fibers to unwind and then join together with one another, resulting in some shrinkage and moisture loss. Normally, meat loses about 30 percent of its weight during cooking. 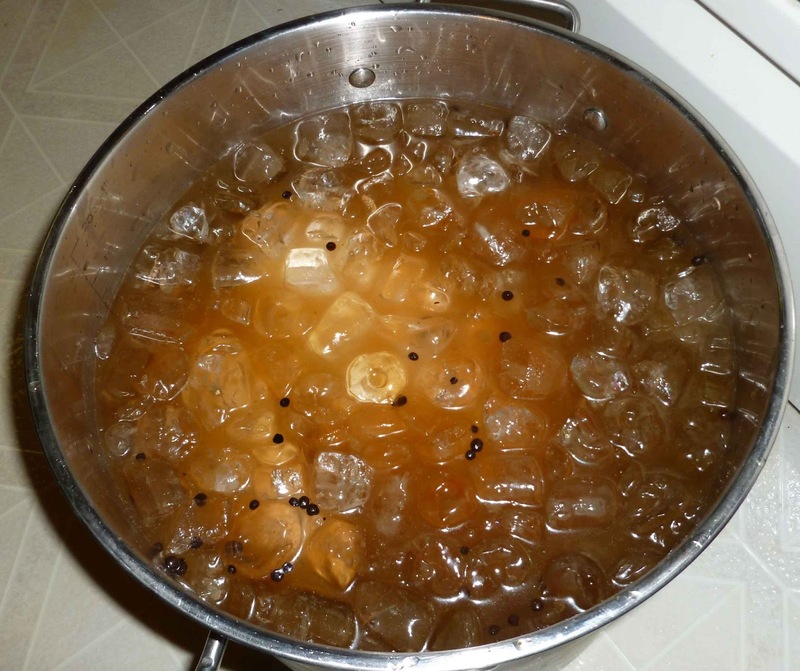 But if you soak the meat in a brine first, you can reduce this moisture loss during cooking to as little as 15 percent, Brining enhances the juiciness, that is a fact. But most of the process is result of the salt which breaks down muscle fiber while adding flavor to the meat. Self basting birds, such as Butterball turkeys, probably don't need to be brined. However, on the Butterball website, even they offer a brining recipe. The turkey I roast is always of the self-basting variety so I don't bother brining it. Maybe I should but, the turkey is never dry, and quite frankly, I can't even think of brining two turkeys. Brining is a choice. Is it always necessary? Probably not. But, since it is kind of a way of salting the meat, while it is still under the skin, it certainly does add flavor! 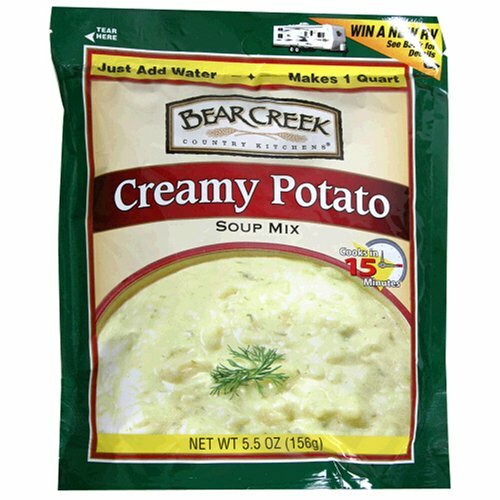 Cheat Chowder...Or Roasted Sweet Potato Soup! Let me start by saying I don't like cream based soups. So bisque on the menu is something you won't find me ordering. Okay, that is out of the way, so let me tell you about a really flavorful white chowder that came as a surprise to me. And it started last winter with a visit to the Philadelphia Home Show. Among the siding, window and pool vendors, was a green trailer offering Bear Creek soup samples. Cold outside, and actually not that warm inside, I decided to try the potato soup version. It was really good, creamy but not super thick. I picked up a bag out of the barrel to see the directions and found the reason why...water. It did not need cream, half and half, or even milk! The great flavor and the absence of cream, opened, what I was now calling a soup base, to a world of possibilities! 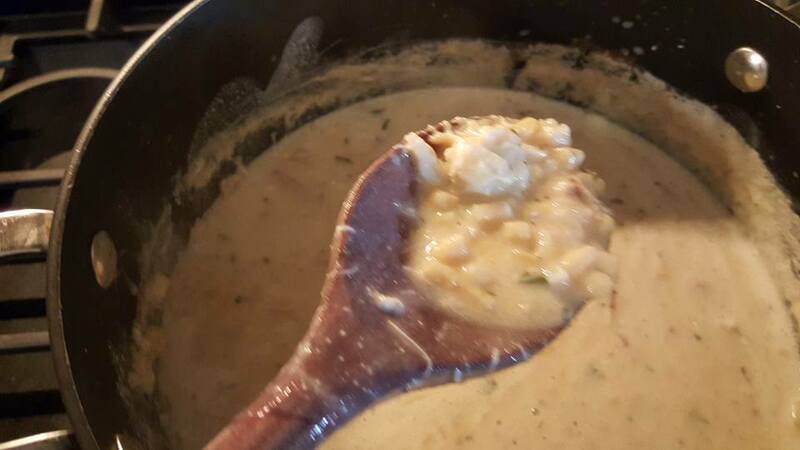 Check out my new Crab Corn Chowder below. 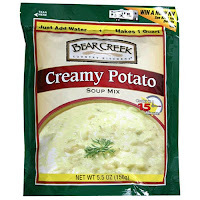 Prepare the potato soup as directed, with one exception. Change 8 cups of water to 6 cups water plus 2 cups fish or seafood stock. Add Old Bay, parsley and allow to simmer on low for about 20 minutes. If soup starts to get to thick, add a little more stock (fish, vegetable, chicken, or even a little more water). Add crab meat and corn and let simmer for about 20 minutes. Don't allow soup to come to a boil at this point because it will break down the crab meat lumps and it's just too expensive to let that happen! By the way, I used this same method last winter to make a wonderful clam chowder. Instead of crabs and corn, I made the soup, then added 1 dozen well scrubbed clams. Once they opened and the clams and juice mixed in with the soup, it was wonderful! (Okay, I also added some chopped cooked bacon and parsley...so good!) Point is, the soup can be the start of many wonder concoctions! Go ahead and get a little crazy! Oyster stew anyone? Now, for a totally homemade great autumn soup, this very simple, but very tasty soup recipe came to me by way of my daughter in law's (Kathleen Phelps) BFF Caroline Harkins. I am always happy when Kitchen Clatter readers send me their recipes. Especially happy when they are this good! Using the flavors of the season, this soup would be fabulous on Thanksgiving! Prick the potatoes with a fork, place on a baking sheet, and roast until tender, 40 to 45 minutes. Meanwhile, heat the oil in a large saucepan over medium-high heat. Add the onion, celery, and apple and cook, stirring occasionally, until soft, 10 to 12 minutes. Halve the potatoes, scoop out the flesh, and add to the saucepan. Add 6 cups water, 2 teaspoons salt, and 1/2 teaspoon pepper. Cook until heated through, 8 to 10 minutes.